As expected, the series started with Cake Week and a what at first seems to be a simple signature challenge. The humble drizzle cake, a firm favourite in many cafés across the country and a particular favourite of old blue eyes. A tart, moist lemon drizzle is a mouthful of heaven, but there are many pitfalls along the route to drizzle deliciousness. Paul was particularly picky when it came to the actual drizzle and the choice of some bakers use of icing as drizzle. For me, a drizzle cake should involve a syrup and an icing, this ensures a moist sponge, full of flavour as well as an icing to finish the bake neatly. I also use a small amount ground nut like ground almonds or pistachios so that the cake stays moist when the syrup is drizzled. After round one, a few of the bakers impressed with their flavours and presentation, but with two more challenges still to go, it was too early to call star baker just yet. The first technical was an interesting one, Jaffa Cakes – which prompted the question on social media, are they cake or biscuit? One for the tax man eh! A brilliant first technical, as there were a few stages to make before assembling the cakey-biscuits. All in all, I thought all 12 did a good job with no major issues, bar the conundrum of which way round the jaffas should be! Selasi came top in the technical, and after a good signature, my money was on this laid back young man for star baker. With a handful of the bakers in the danger zone, a new day gave way to a new challenge and a final opportunity to prove that they belonged in the meringue marquee. Their challenge was to bake a fatless sponge by the name of genoise and decorate it with a mirror finish glaze. This can be achieved through a chocolate ganache of sorts, an icing or a fruit glaze. I’m not too sure what happened during the challenge, but nerves git the better of many of the bakers with quite a few of them having to make their cakes again….and the same for the buttercreams and ganaches….come in guys, it’s only cake!! Selasi and Jane impressed once again with flavours, techniques and presentation, although Paul and Mary would have liked to have seen more of a shine on Selasi’s glaze. Louise, a fellow Cardiffian’s cake wasn’t the prettiest in the tent, but what it lacked in beauty it made up for in taste – well done lovely! Candice didn’t quite manage to please the judges as she’d hoped and was very teary waiting to hear the outcome of the weekend’s challenges. But, luckily for her it was Lee’s time to go with his showstopper simply being too simple and sadly too dry. Well done star baker Jane, a good start to your Bake Off CV. Next week the bakers are tasked at constructing from gingerbread, expect tumbling biscuits and possibly more tears. 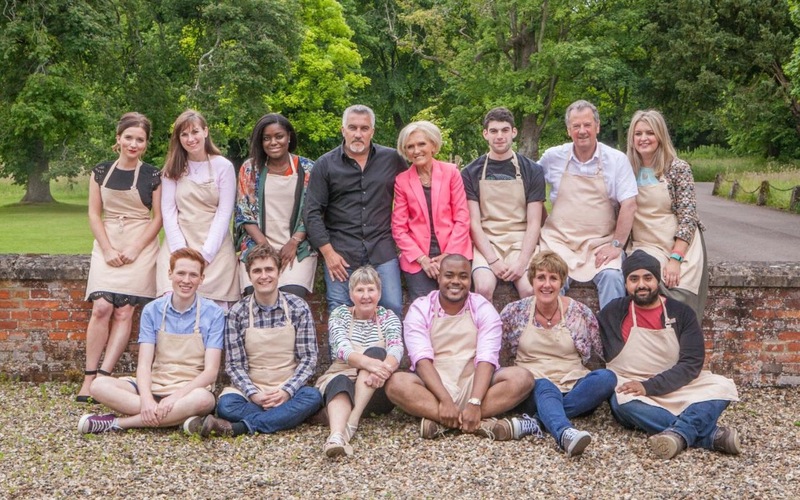 Hooray for the return of Bake Off! !